Wow! This was a wild ride and just what I needed to get me out of my reading slump. I went into it not really knowing what to expect, and I'm so glad I did because I loved experiencing all the twists and turns along the way. 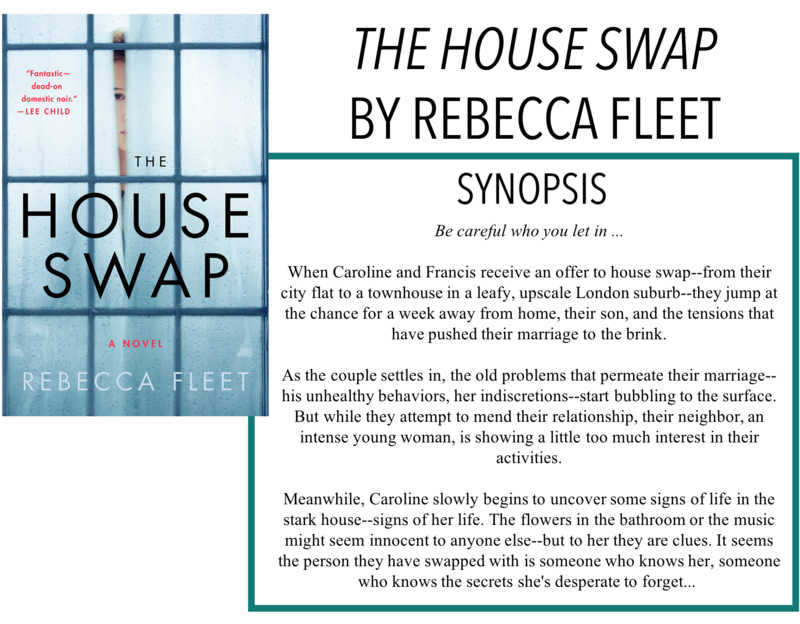 I'm back with another review, The House Swap by Rebecca Fleet. Thanks so much to Penguin Random House for sending me a copy of this book for an honest review, as always, all opinions are my own. I won't say too much about the synopsis because I think it is better to go in blind but the story basically follows a couple, Caroline and Francis, who are participating in a house-swap. They see the trip to the countryside as a getaway to focus on themselves and not the problems of their past - his addiction, her affair. But soon Caroline starts to wonder about the person whose house they're staying at, and who is staying in their own. There are clues that no one but she would notice all around the sparsely decorated space, someone has perhaps put them there to tell her they haven't forgotten what Caroline did. The writing style and pacing of this book were both done perfectly - I was hooked from the beginning and the suspense was just subtle enough to hold my attention without making for a break-neck pace. I don't know what it is about English authors, but they always end up using such a well-rounded vocabulary - and Fleet is no exception. In terms of characters and plot, I found myself not necessarily liking or agreeing with some of the characters and their actions, but I was so engrossed in the story that I wasn't able to really pass any judgement in the situations they got themselves into. I know that seems a bit vague, I just don't want to spoil anything major. I thought that the concept was really original, in terms of thrillers, I've never read one that was set up like this or had this sort of premise and I really enjoyed the uniqueness of that aspect. It's not your typical fast-paced thriller, its slow-building but worth every moment you have to wait for the big reveal. There were one or two things that didn't sit with me 100% right, and I think that's where I can't give this book a full 5 stars but otherwise, I really enjoyed it. Overall, this was a slow-burning (but never boring) suspense story with a unique premise!